With the draw completed— and brackets determined—Team USA’s five judokas have started preparing for their paths to the medal podium. Head coach Jimmy Pedro believes the draws give the Americans several chances at returning home with some hardware, and the two-time Olympic medalist knows exactly what it takes to excel on this stage. 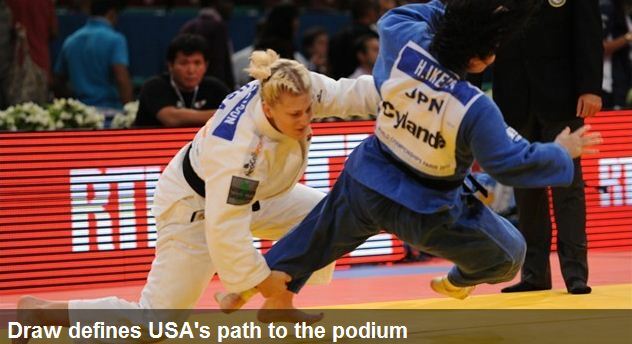 Kayla Harrison, seeded fourth in the women’s -78kg/172 lb. weight class remains Team USA’s best chance at not just securing any medal, but the country’s first ever gold in judo. Pedro said that Harrison’s looming quarterfinal matchup against Abigel Joo of Hungary could be her most difficult one, but that they are prepared. Click for times to watch Olympic judo on NBC online. This entry was posted on July 27, 2012 at 7:48 pm and is filed under Olympics. You can follow any responses to this entry through the RSS 2.0 feed. You can leave a response, or trackback from your own site.